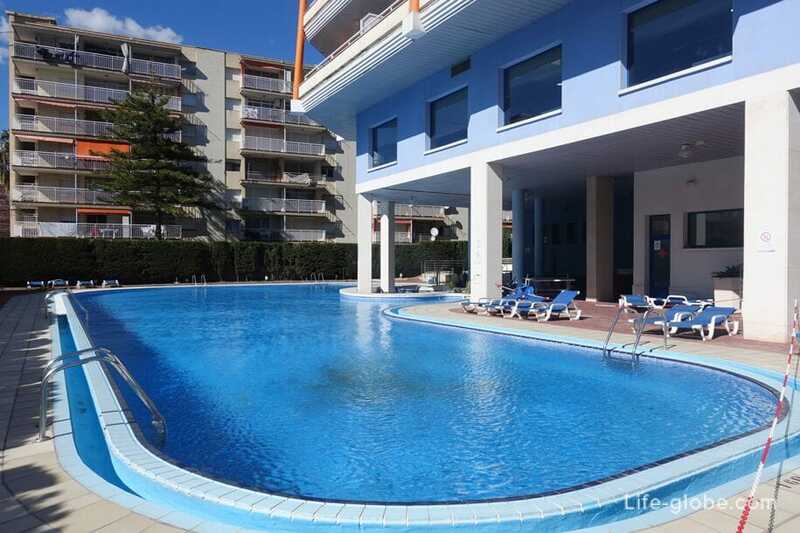 The hotel Medplaya Pyramide Salou (Medplaya Piramide Salou 4) - has 4 stars and is located in the centre of Salou, just 650 metres from the Eastern end of the most visited, longest and popular beach of Salou Llevant, at the following address: Viladomat, 9, 43840 Salou, Spain. This hotel has a convenient location. 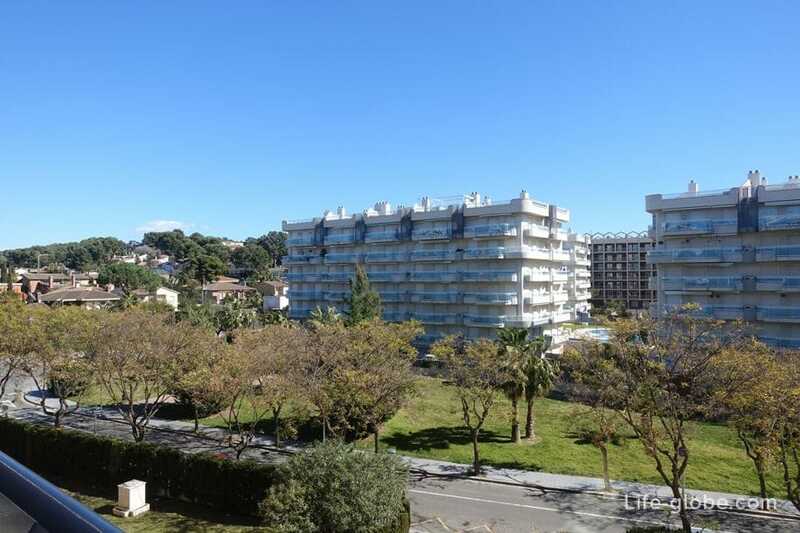 To the beach and walking Boulevard named after king Jaime I, where boils the resort can be reached in just 8 minutes. 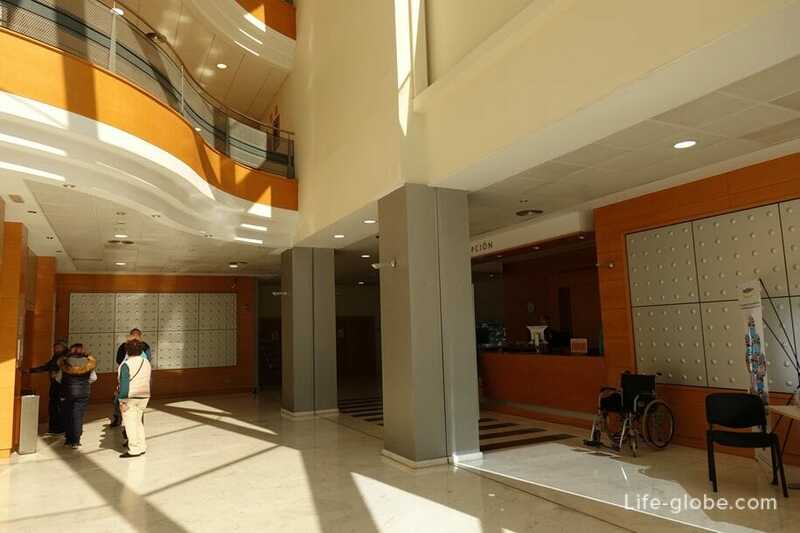 Also the hotel is surrounded by shops, bars, cafes and restaurants and the main attractions of Salou are within walking distance. 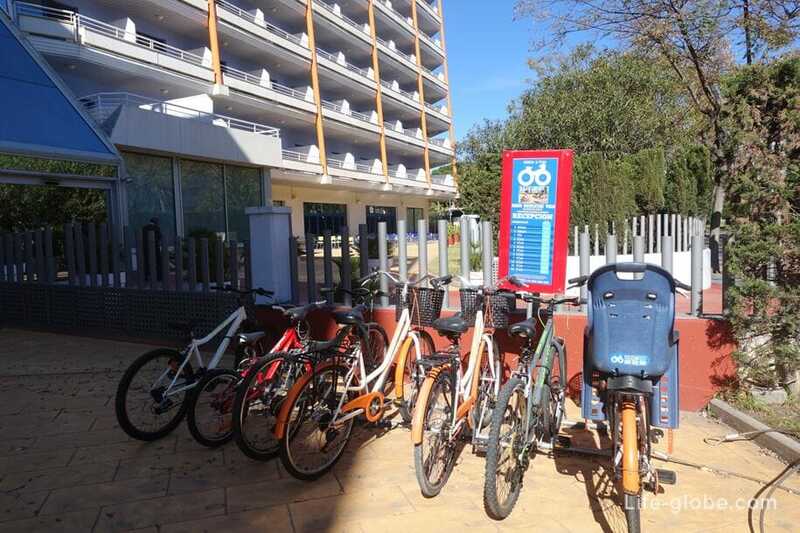 For reviews of tourists the hotel has earned a rating of "Good" (7,4). Free Wi-Fi fished very well throughout the hotel without a hitch (you can download movies). In number of rooms: 2-bedded and family rooms. Clean rooms, clean produce daily. 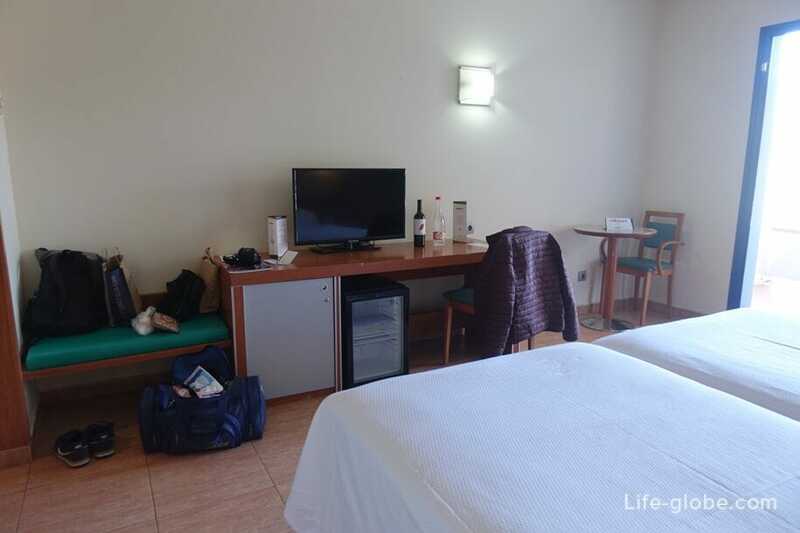 In standard double rooms: beds by type of room (mattresses high and comfortable bed linen, pleasant to the body), bedside tables, air conditioning and heating, a desk and a small round table, two chairs, a TV and a mini bar fridge. 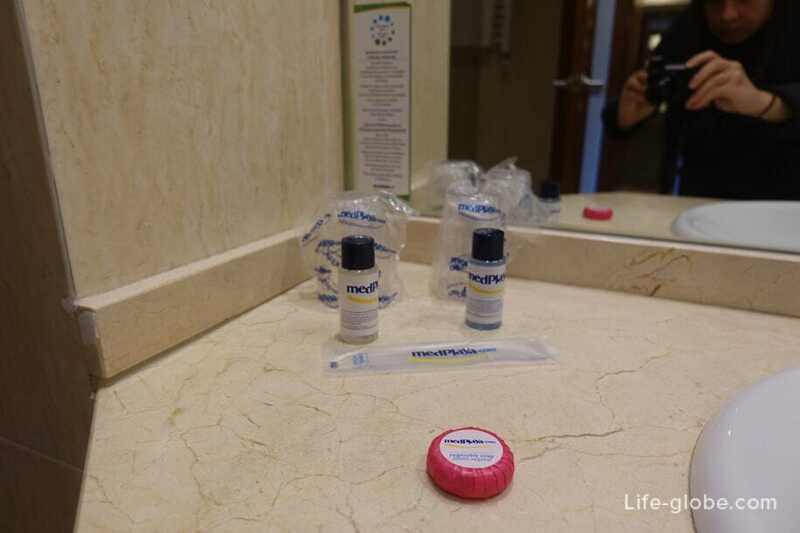 When you check in, as a compliment, in a hotel room was waiting for us a bottle of wine and a bottle of clean drinking water. 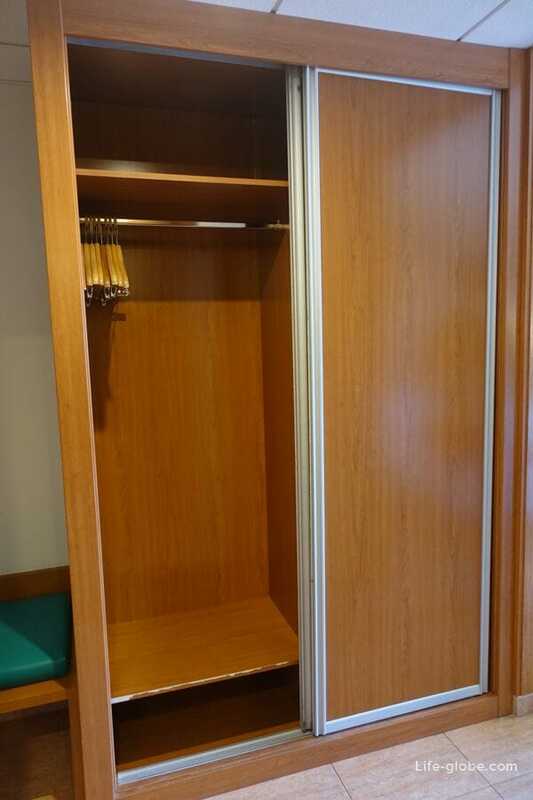 In the hallway of the room is a large spacious wardrobe in which there were two warm blankets and a safe which you can use without charge. Instructions for use of the safe is here. Bathroom. 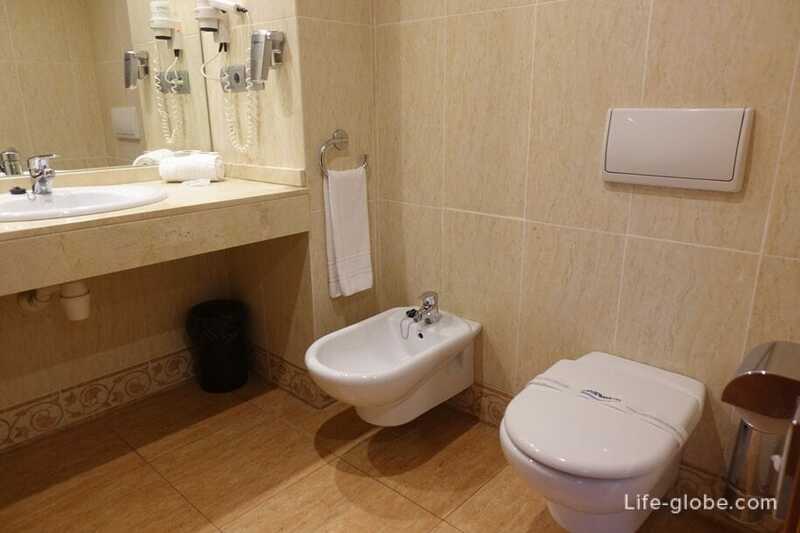 A private bathroom is also spacious and bright. 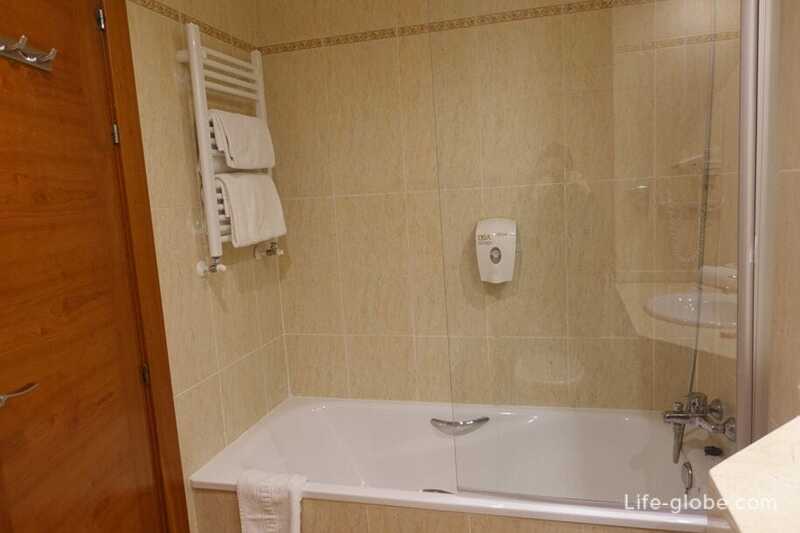 In the bathroom: large sink, bidet, toilet, Hairdryer and large mirror. A set of towels per guest. And free toiletries a personal comb, soap, shampoo, shower gel and disposable cups. 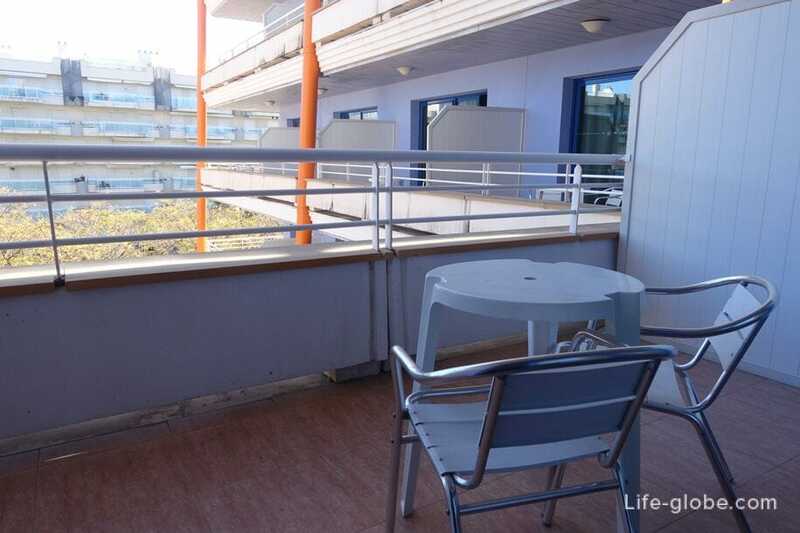 The balcony is also quite spacious. On the balcony plastic round table and two chairs. The view from the balcony depends on the room's location. 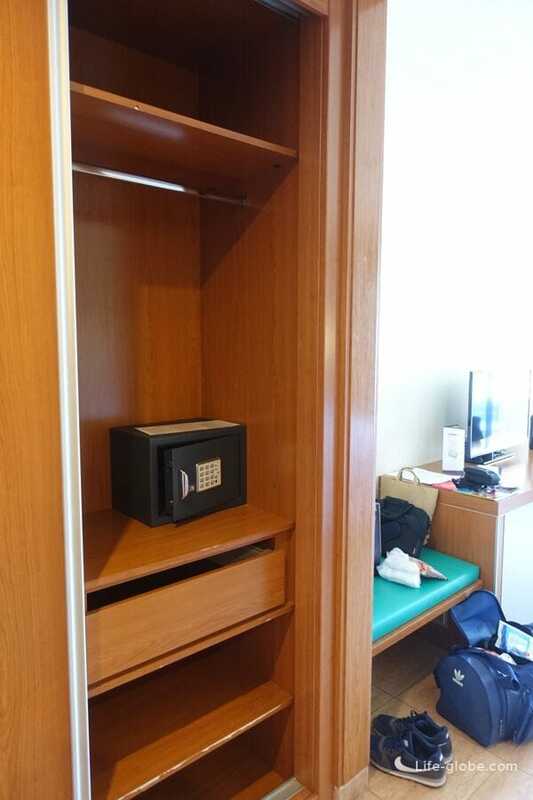 The room price includes Breakfast "buffet". 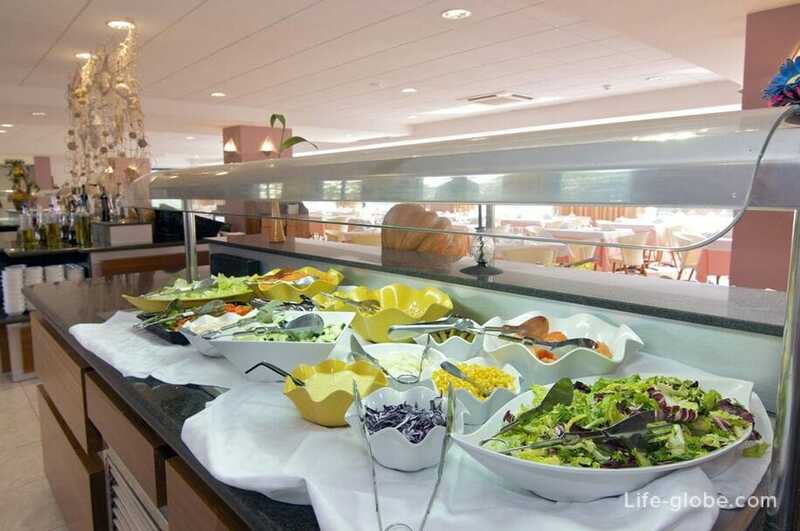 You can choose accommodation with Breakfast + dinner or Breakfast + lunch + dinner. We booked the room with Breakfast and dinner. Drinks for Breakfast are free, but the dinner was paid. There are rooms with drinks included for dinner, depends on room category. 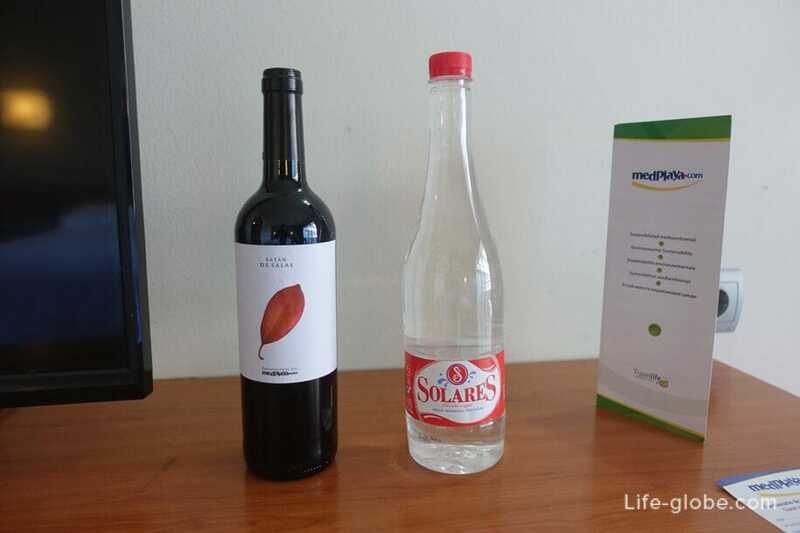 When the drinks for dinner, give a bottle of red wine and a bottle of drinking water. If drinks are not included, can be purchased here at the restaurant: a glass of wine or beer - 4 Euro, a bottle of wine 7 Euro, bottle of water 2 Euros, depending on volume. For a fee you can purchase: alcohol, whiskey, wines and other drinks. The downside for us was - no hot drinks for dinner, and poor quality coffee and juice for Breakfast. Otherwise, no complaints. The restaurant is roomy. Breakfast buffet varied. A selection of delicious desserts, to 5 kind of ice cream, salads, soups and other hot and cold meals and snacks. For dinner some of the dishes change daily, so twice was lasagna, burritos. 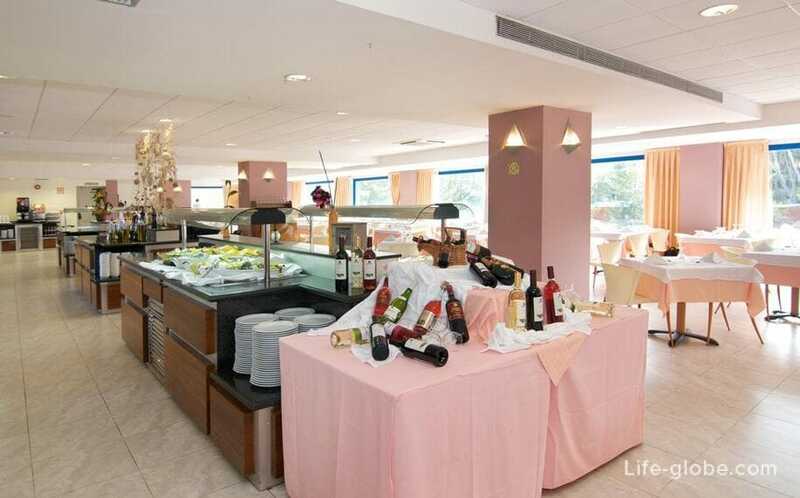 In the restaurant of the hotel Piramide Salou is the area of the grill where you cook hot meals. For Breakfast it's scrambled eggs, omelets and pancakes. 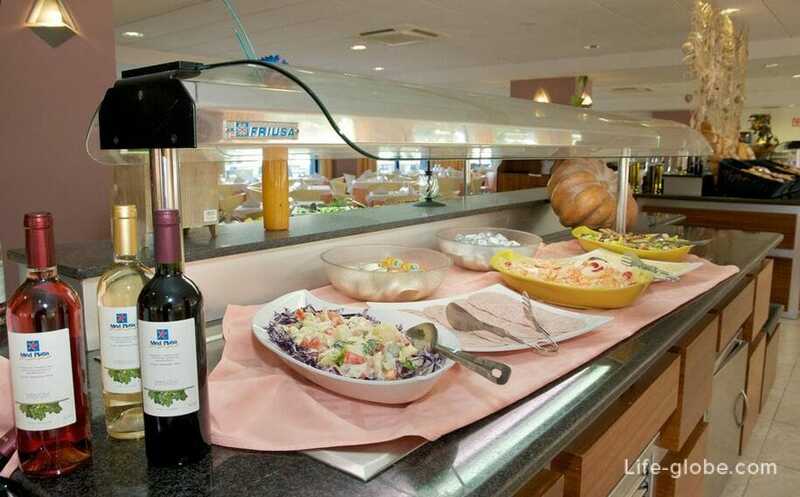 Dinner dishes change daily: assorted meats, fish, grilled vegetables, etc. At the reception and in the corridors of the hotel is quite spacious, there are two elevators. 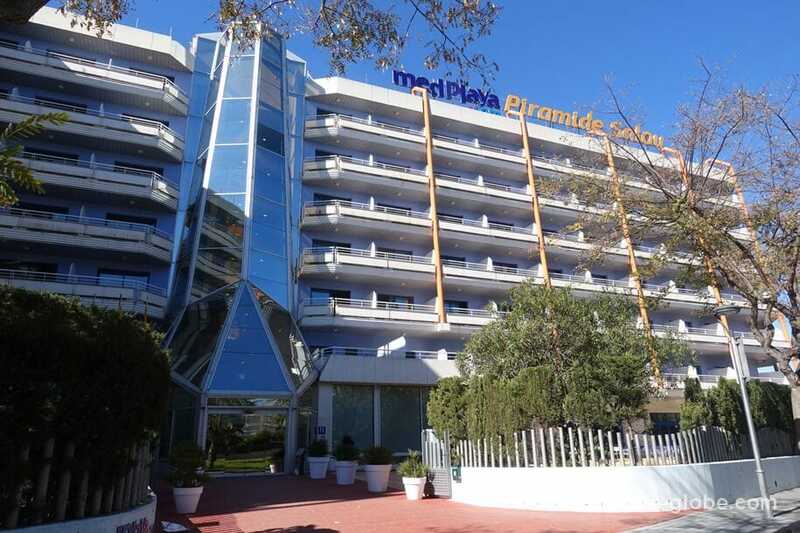 The staff at the hotel Medplaya Piramide Salou speaks: English, Spanish, Catalan, French, Italian and Russian languages. 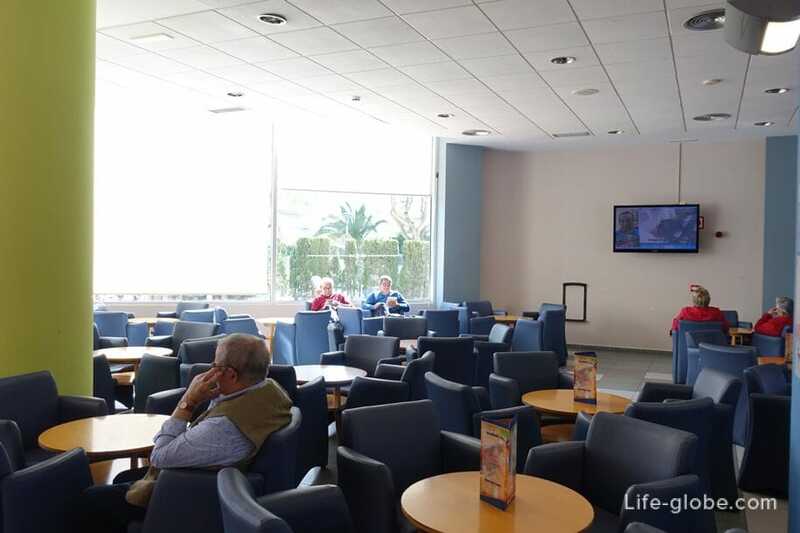 Check-in is from 13:00 to 00:00 hours. Check - out before 11:00 hours. 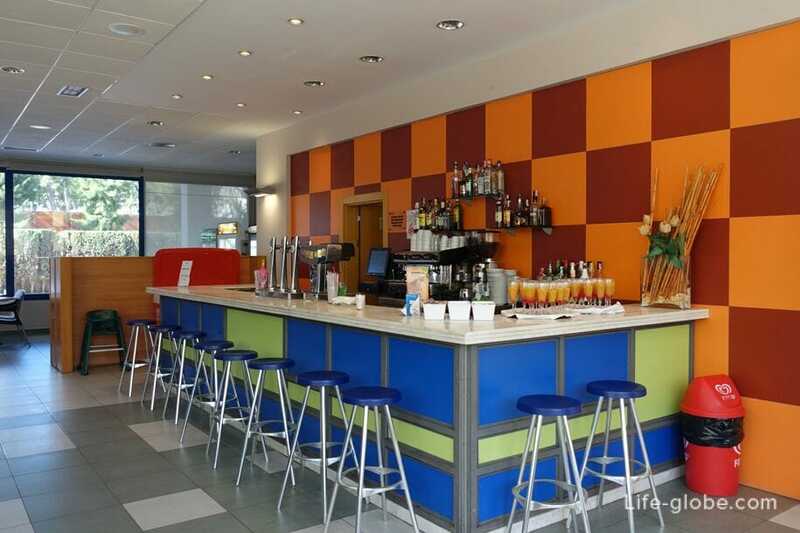 There is also a bar and a area of the evening activities: animation, live music, dancing, etc. The hotel area is small. The pool is also small runs in the summer. Near the pool are sun loungers. 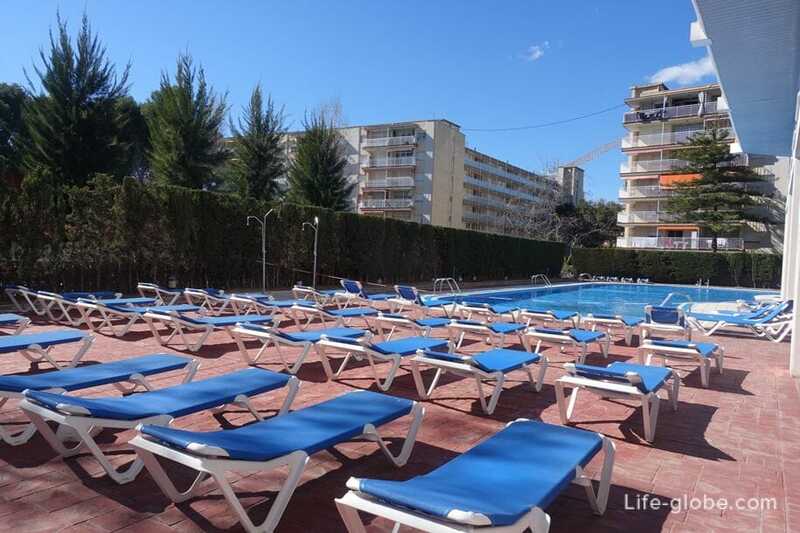 It seems that during operation of the pool, spots on the sun loungers and in the pool, considering that the hotel is great, is not enough. 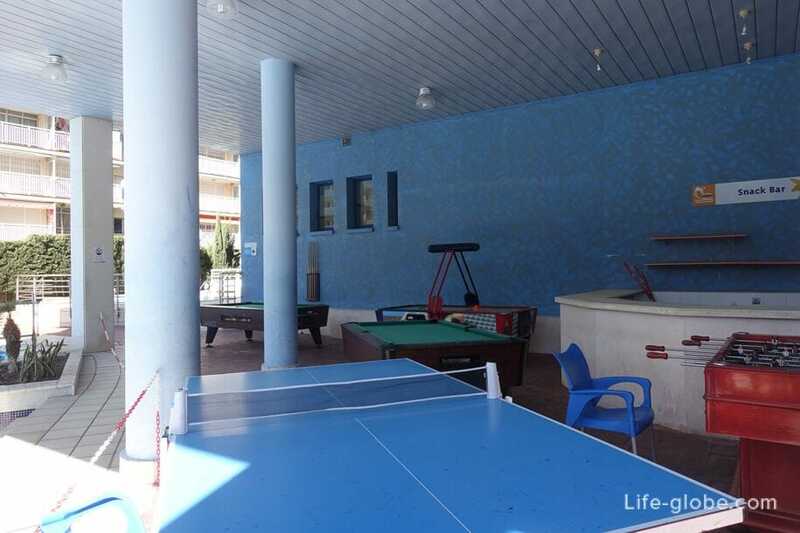 Near the hotel there is a small play area where, for a fee, guests can play Billiards and table tennis and Darts. 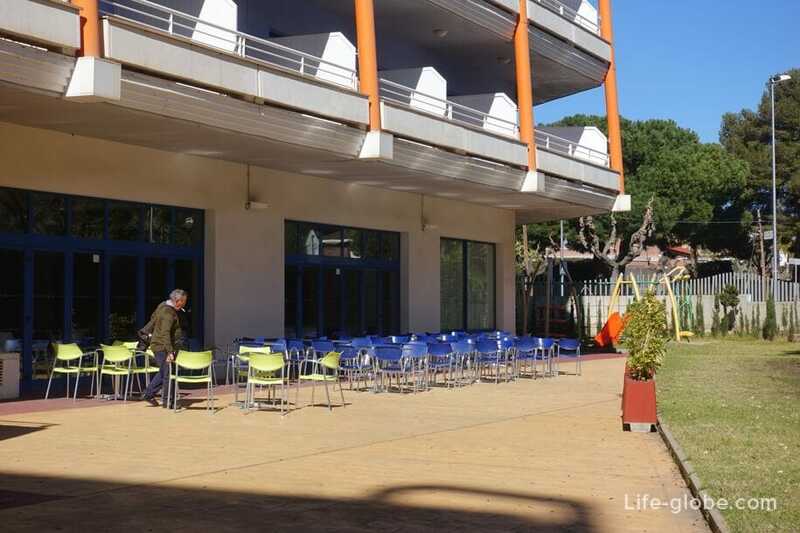 Tables and chairs in the open air near the hotel - convenient for guests in good weather, and a small children's Playground and Bicycle rental. Additional services: Ironing, Laundry and massage. At the hotel's tour Desk can arrange car rental. For a surcharge Parking on site. This hotel is nice and well deserves the assigned evaluation. 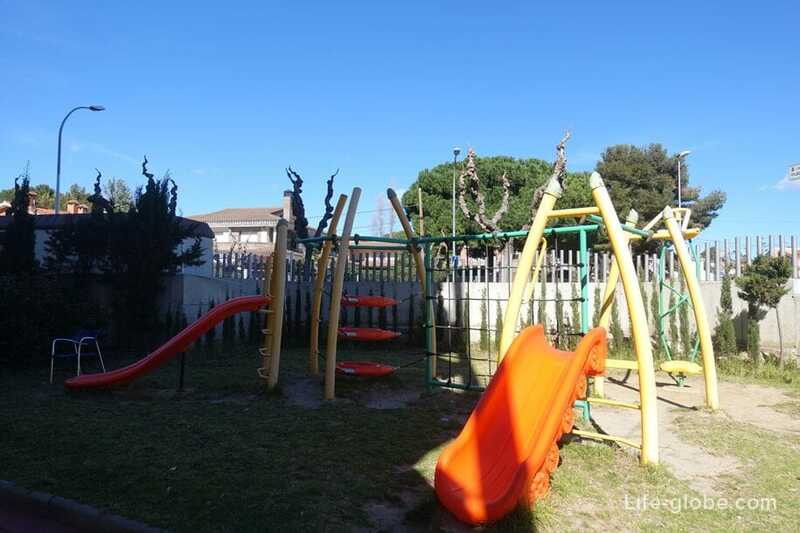 Excellent location, within walking distance of the beach and all major attractions, supermarkets and restaurants, close to public transport, unobtrusive and polite staff, tasty and varied food buffet. 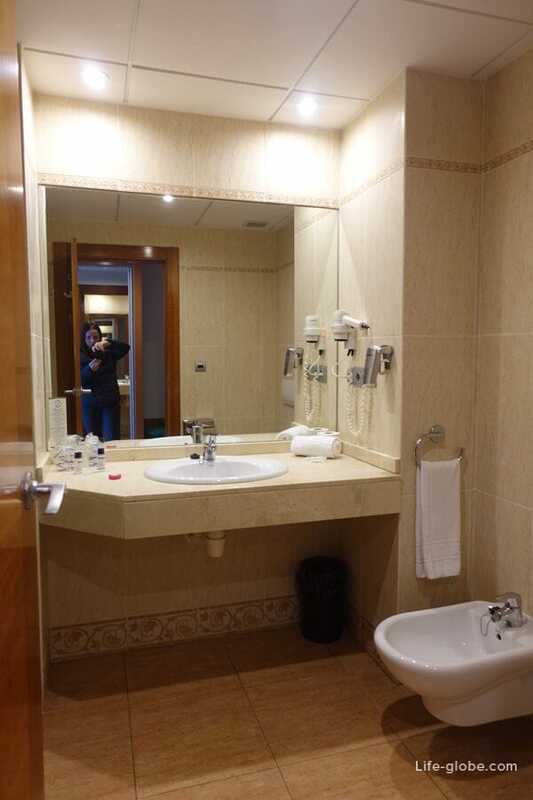 And spacious and bright rooms, convenient to operate, and well, the rest, of course, too)). The furniture in the rooms is not new, sometimes tacky, but for us it does not represent value. 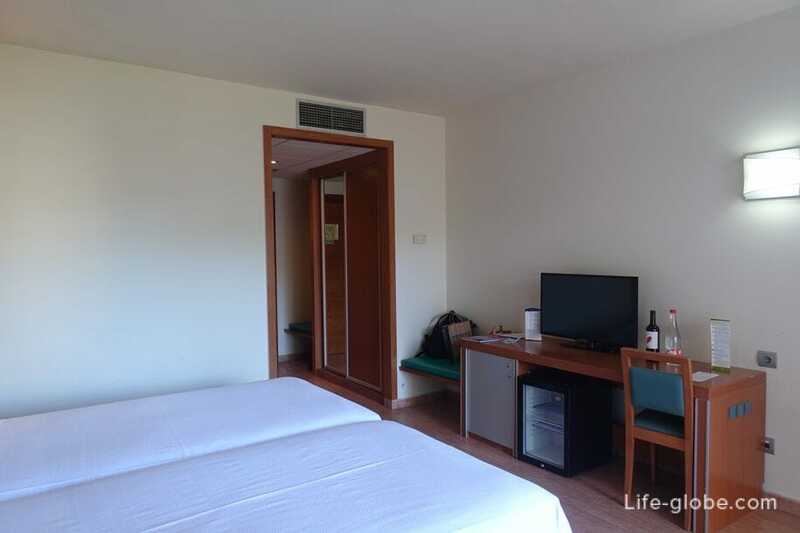 But the cleanliness and spaciousness in the rooms, as well as natural lighting thanks to the panoramic Windows, is a plus. 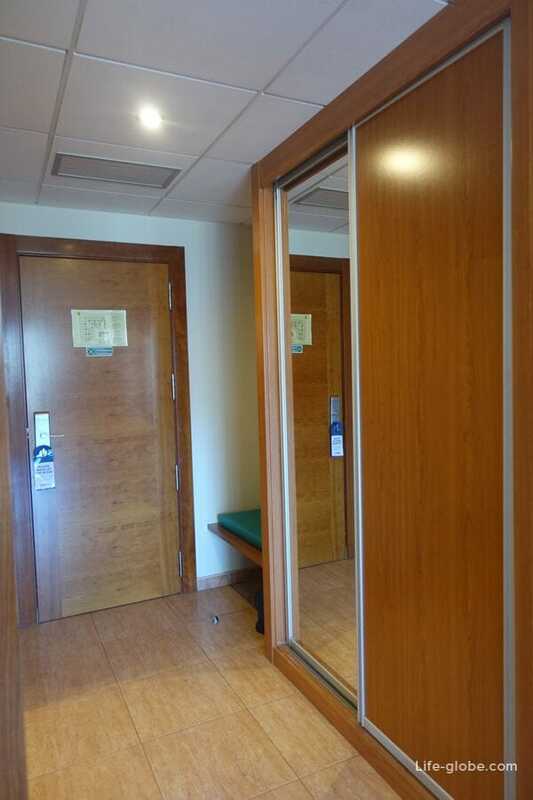 This hotel can be a good choice, if you are interested in: the center, sandy beaches, walks along the quays and the proximity of public transport. 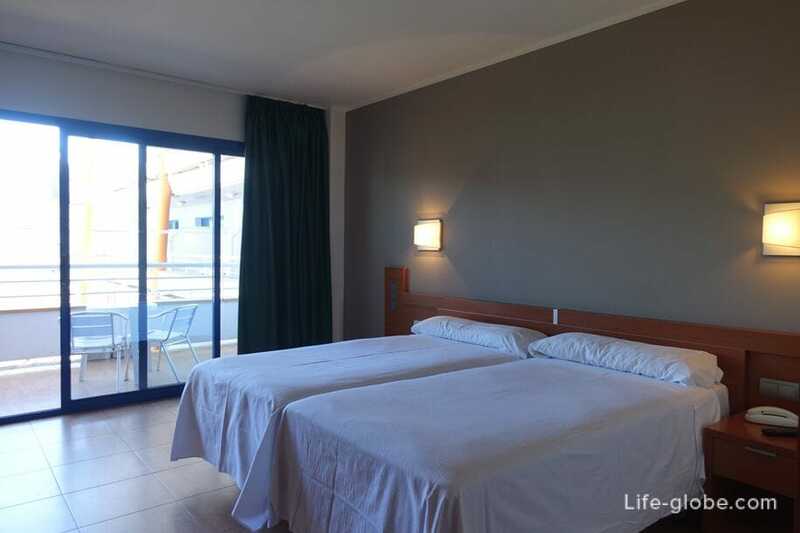 C our view of Hotel Medplaya Pirámide Salou is a decent option for a pleasant and comfortable stay in Salou ratio "Price/Quality".